The KK Rollcrush compacts a multitude of waste products in open containers, increasing weights in open containers from around 2 tonnes to 10 tonnes. This reduces the transport element of waste disposal costs by 80%. This machine destroys a multitude of waste including metal frames and wooden pallets to a fraction of their original size inside 35 yd³ and up to 50 yd³ open containers, with compaction ratios between 3:1 and 7:1 depending on the type of waste. 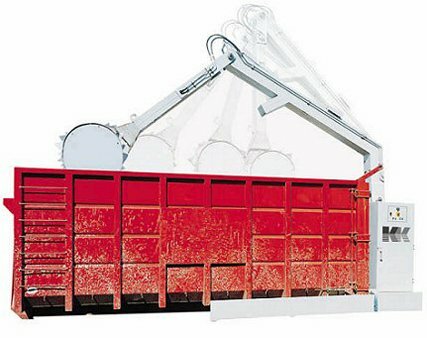 The aggressive drum breaks up and compacts the waste to maximise tonnages. The spiked drum which weighs 1.5 tonnes breaks down the waste to make full use of the space in the container so you are not paying to transport air. Different drums are available depending on the waste to be compacted. The rollcrush is able to deal with almost every type of bulky waste, from wood to washing machines. There is a variable cycle time option so you can let the machine do all the work while you are off working on something else.